Compared to a typical American diet, the plant-based approach to meal planning is higher in unsaturated fats, fiber, usually has better nutrient-density and contains more vitamins, minerals and phytonutrients. It is no surprise many people are interested in modifying their lifestyle to follow a plant-based eating pattern! Perhaps the reasons approach to eating is growing in popularity is that it doesn’t mean going vegan or vegetarian, eliminating any macronutrient or even prohibiting certain foods. Plant-based eating includes fruits and vegetables, whole grains, a variety of protein-rich foods such as beans, peas, nuts, seeds and soy. Dairy products, seafood, lean meats, eggs and poultry are also on the menu, but are not the focus. Animal- sourced protein becomes complementary to your meals instead of the dominant choice. It is also encouraged to minimize the use of additives such as salt and sugar to enhance flavor and to rely on herbs and spices. Plant- based diets are helpful in reducing risk for chronic disease, but it does require some effort to look for some variation to your routine menus. It is not an all-or-nothing proposition, to get started you can simply choose a meal you eat routinely and substitute the plant protein for the animal-based one. For example, if tacos are on your menu, choose two different types of beans for the filling and skip the meat. As an alternative for meat-based lasagna, use vegetables only! As previously discussed on a previous blog, the clear majority of people are overeating protein. Therefore, when changing to plant-based eating, they won’t suffer any side effects from perhaps a bit lower protein intake. Interestingly, plant-based eating often matches the same amount of daily protein intake. Beans, nuts, peas and other legumes are rich in protein and can easily make up for the lack of animal foods. As a bonus, these foods offer more than just protein. They have a much wider variety of nutrients and fiber, something you can find in animal foods. The recommended fiber intake is 38 grams for men and 25 grams for women, with all fiber counting to achieve daily goals. If you are also moving towards plant-based eating, we have a fantastic sauce for you! This tahini dipping sauce can be used in many ways. For example, it can serve as a topping to roasted vegetables, as a dip for raw veggies and when thinned, and it can be used as salad dressing. Plant-based ingredients can deliver flavorful sauces that include an array of culinary textures and nutrients. In small bowl add tahini, salt, and garlic and mix well. Next, slowly add one tablespoon at a time of warm water to the mixture until the desired thickness is obtained. Suggestions: 3 tablespoons of water for a dip, or 5 tablespoons of water to use as a sauce for entrees. 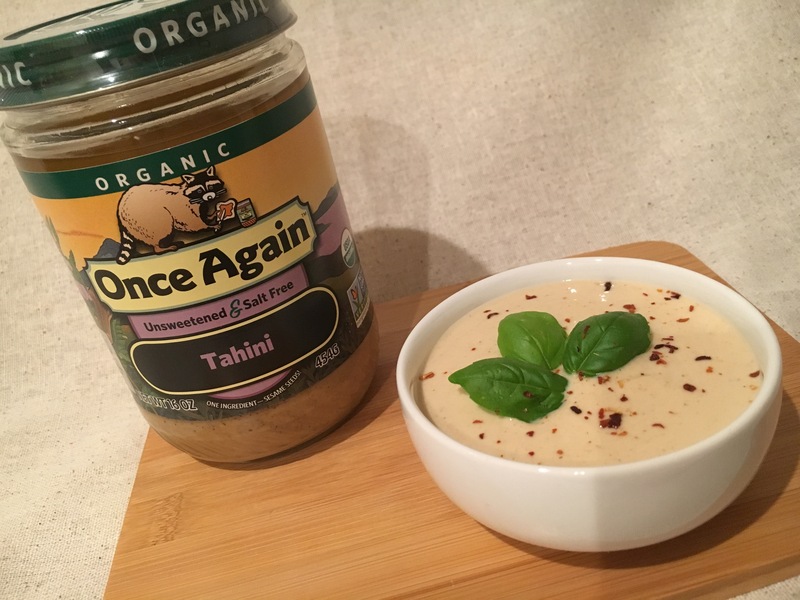 The Tahini Dipping Sauce is really delicious on salads, or with spinach, green leaves.